Synthetic peptide corresponding to Human MTA2/PID aa 652-668. Our Abpromise guarantee covers the use of ab8106 in the following tested applications. WB Use a concentration of 0.5 - 1 µg/ml. 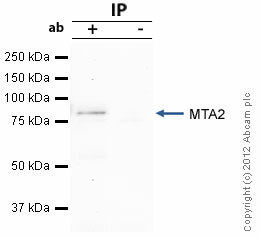 Detects a band of approximately 75 kDa (predicted molecular weight: 75 kDa).Can be blocked with Human MTA2/PID peptide (ab6243). May be involved in the regulation of gene expression as repressor and activator. The repression might be related to covalent modification of histone proteins. 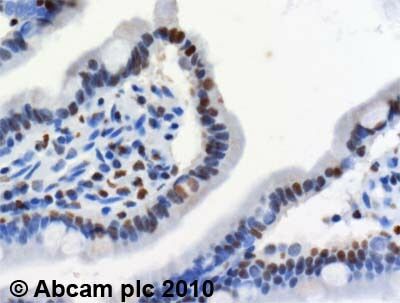 ab8106 (2µg/ml) staining MTA2/PID in human ileum using an automated system (DAKO Autostainer Plus). Using this protocol there is strong nuclear staining. MTA2/PID was immunoprecipitated using 0.5mg Hela whole cell extract, 5µg of Rabbit polyclonal to MTA2/PID and 50µl of protein G magnetic beads (+). No antibody was added to the control (-). 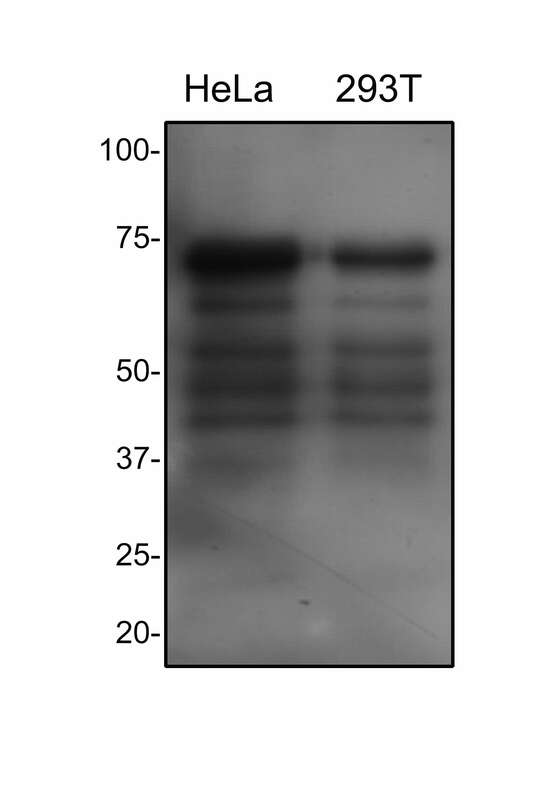 Proteins were eluted by addition of 40µl SDS loading buffer and incubated for 10min at 70oC; 10µl of each sample was separated on a SDS PAGE gel, transferred to a nitrocellulose membrane, blocked with 5% BSA and probed with ab8106. 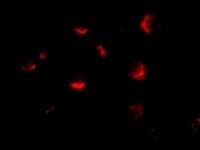 Immunofluorescence of PID in HeLa cells using ab8106 at 10 ug/ml. Publishing research using ab8106? Please let us know so that we can cite the reference in this datasheet.